The visiting Chinese premier Li Keqiang to Pakistan has offered Pakistan to help and end Pakistan's grave energy crisis. Due to mismanagement of the previous governemnt of the Pakistan Peoeples Party, the country has plunged into in a situation wher epower outages spell lasts 20 hours a day - bringing its fragile economy to a stand still. 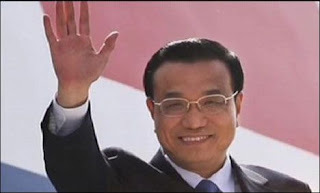 Li arrived in Islamabad Wednesday on a two days official visit to Pakistan. This was his second visit to Pakistan and first visit as Chinese premier since taking office in March. It may be added that Pakistan was one of the first countries to recognize China in 1950, and they both consider each other "all-weather friends".